Mark Pulling hailed Lancing’s fighting spirit as they forced an FA Cup replay last night. Shaquille Hippolyte-Patrick fired two divisions higher Southern League Premier Division South outfit Hendon ahead but Lancers struck back through Jack Langford - his seventh goal in just two games - as it finished 1-1 in the second qualifying round clash. 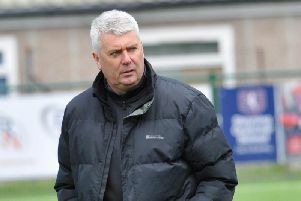 Manager Pulling heaped praise on his side, who were reinstated into the competition last week after an investigation found Phoenix Sports fielded a suspended player in the previous round. He said: “We’ve shown what we are capable of in one off games in the FA Cup this season. Hippolyte-Patrick put Hendon ahead on 24 minutes but Langford, fresh from a double hat-trick on Saturday, levelled things up 12 minutes from time. LANCING: D’Cruz; Willard, Bygraves, Tighe, Pittock, Diarienzo; Saunders, Pulling, Tredrea, Daniels; Langford. Subs: Maman (Daniels), Webber (Tredrea), Petit, Madhiazi, Gunn.